As a Roblox developer, it is currently impossible to set a genre to my team’s game in such a way that it connects players looking for that genre to the game. 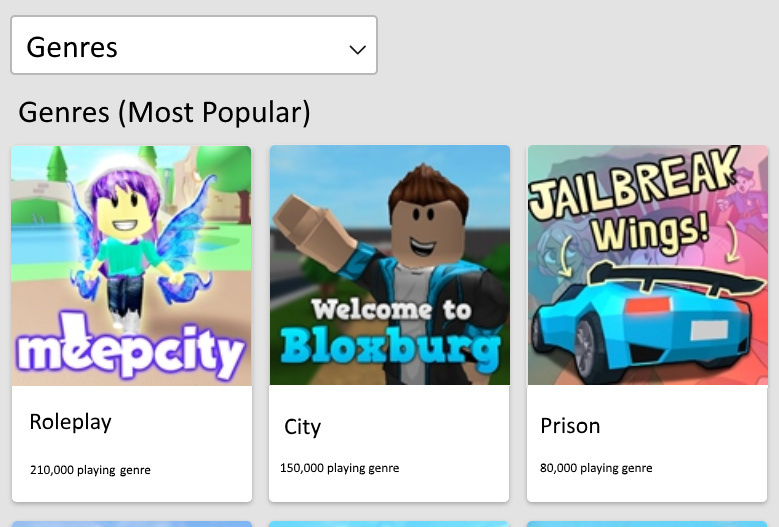 As a Roblox player, it is currently impossible to search for / seek out Roblox games by genre. The previous genre system that existed on Roblox for many years was extremely limiting to the creativity and imagination of the developers and game designers, this is not a post that is advocating for the return of the pre-curated genres. Instead, this is advocating for “User generated tags” for games, where the user votes and therefore generates the top tags for any given game. Roblox is no doubt successful due to user generated content. I see user generated tags for games to produce genres as a logical step in Roblox’s development as a platform for user generated content. This feature request would up the professionalism of Roblox as genres will be organized according to the market, adding onto the sucess Roblox has already attained by having user generated content produced according to the market. I ran an experiment. I produced a list of terms for my game that I think described the gameplay. Then I linked it to the game’s communities and they voted on what they believed to be the top 5 tag words for the game. 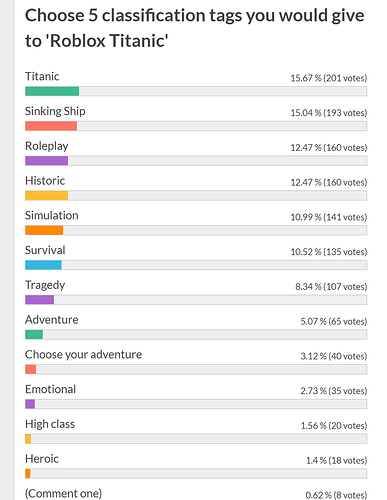 The top 5 tags according to a large sample size, were 'Titanic", “Sinking Ship”, “Roleplay”, “Historic”, “Simulation”. Those 5 tags would be a way to connect players specifically searching out those tags to easily view the game, rather than using the Roblox search, or scrolling through the liquid games page for several minutes. As more games are produced and crowd the games page, this will become more important. The following picture is a concept for how players search for games by genre. Stemming from the success of the liquid games page, this is the liquid genres page. The most populous game of the genre could get the icon for the genre, (perhaps add something to differentiate the icon so players don’t think it goes straight to that game). When you click on the genre/icon, it shows a liquid version of the games page with games tagged by that genre, sorted by how many votes the game has for that genre OR how popular the game is within that genre. There could be multiple way to search within the genre search section of the games page, which is why I added a “(Most Popular)” differentiation. If Roblox is able to address the issue of game genres, it could improve average visit length and player retention as players look through genres on the games page to find some games of their favorite genres, instead of wasting time playing something to figure out it was not what they were looking to play. User generated tags for genres with an integrated genre search sort would improve Roblox and create a more professional environment for developers.